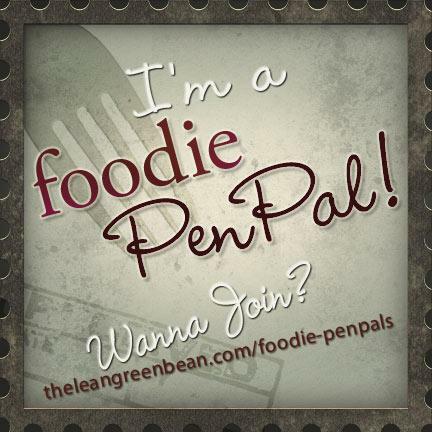 It's time again to share another great month of the Foodie Pen Pal program with you! I can't tell you how excited I get when I get the names of the people I get paired with, then going out and shopping, receiving and trying new goodies. Every month I enjoy this program more and more. I was also paired with Angela from New Jersey who sent me my goodies this month! I told her that I also like trying local foods. She included some great items that were also all gluten-free so that Joe could enjoy them as well (which he loved). She sent me a wonderful and thoughtful package; we had a great time trying all the goodies that she included and learning of some great new (for us) brands! Way Better Snacks Sweet Potato Tortilla Chips: These were absolutely delicious! I didn't get to have very many of these because Joe absolutely devoured them. I'm keeping a lookout for these. Nanina's in the Park Vodka Sauce: This sauce is a local New Jersey pasta sauce and was voted one of the best pasta sauces! We are going to have this next week with gluten-free pasta and grilled chicken, as suggested by Angela. Never had vodka sauce before so I'm looking forward to trying this. Tastefully Simple Spinach and Herb Dip Mix: This mix is so versatile! I mixed this in with olive oil mayo and parmesan and spread over chicken breasts to bake in the oven-- this was so good, we're going to have it for dinner again tonight! Stonewall Kitchen Raspberry Honey Mustard Dip: Yeah, I'm really starting to like mustards. Just no yellow bottle! I used this as a spread on a turkey sandwich. Ooh lala! Thank you ladies for making a this month such a memorable experience!